The Callaway GPSy Golf GPS Watch is Callaway’s attempt to crack into the golf watch market. Technically, this golf watch is produced by IZZO and simply marketed by Callaway. But we’ll refer to the golf watch as a Callaway watch to make things easier. The Callaway GPSy is a fairly slim golf watch with a nice sized face for displaying relevant information. It is not a flash and bang GPS watch like the touch screen Garmin S6, but it is a solid meat and potatoes watch that is available at an affordable price. 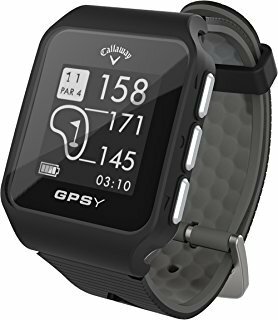 If you’re in the market for a golf GPS watch that is light weight, easy to read, and affordable, this is the best golf watch for you. 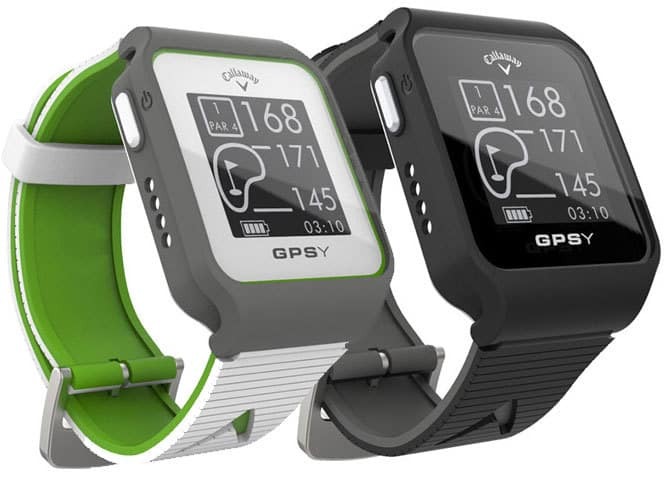 The Callaway GPSy golf watch gives you the yardage to all greens, hazards and dogleg positions on the course. The watch face on this golf watch is a rectangle shape as opposed to a round watch face. This gives the watch more surface area to display yardages to various points on the golf course. This subtle but important design difference makes this a great watch for golfers who have a hard time seeing yardages on small golf watches – and those who prefer a simple and clean design. This golf watch also come with a scorekeeper function that tracks scores, greens in regulation (GIR), and putts per round. This is a great little update to this watch that gives you game improvement tech right on your wrist. With this feature, post round analysis is much easier and you can really isolate the strengths and weaknesses of your game. 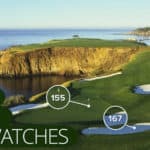 Just like many other golf watches, the Callaway GPSy golf watch golf watch comes pre-loaded with over 30,000 golf courses. 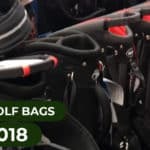 This is fewer than some of the Garmin products (40,000+), but it is enough to cover just about any municipal golf course or private club. This golf watch does not have the the drawbacks of a subscription-based device and requires no subscriptions or monthly fees. After charging this device, you only need to turn it on. For any course updates that become available, you simply need to plug it into your computer to run the software. 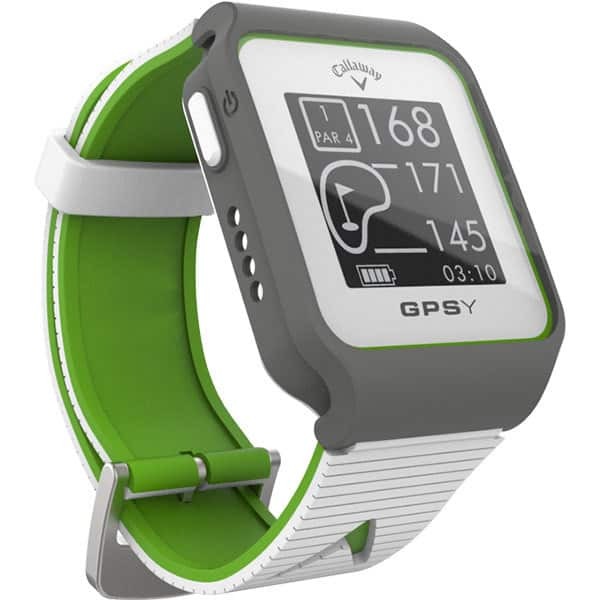 The Callaway GPSy golf watch measures 10.25” x 1.5” x 0.5”, 1.28” and weighs 2.24oz. The screen is sunlight readable and rectangle making it easy to see the golf watch during sunny days. 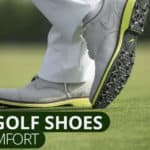 Although this golf watch does not have a touch screen, it has a simple design and provides the user with accurate yardage to almost all relevant points on the golf course. According to Callaway, the battery life on the Callaway GPSy golf watch lasts for 90 days in non-GPS mode and 10-12 hours in GPS mode. 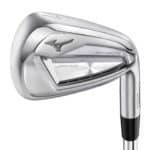 This means that you should be able to get 36 holes of golf in before you have to recharge it for the next round. The Callaway GPSy Golf GPS Watch is a great golf watch for golfers looking for a sleek, simply, and lightweight golf watch. This golf watch is not jam-packed with all kinds of tech, but gives you exactly what you need to improve your scores. This golf watch provides you with accurate yardages, a digital scorekeeper, and has a solid battery life. All in all, this is one of the best golf GPS watches for golfers looking for a reliable, simple, and lightweight golf watch. to 20 minutes to do so . I have been on the 3 rd hole when it kicks in . Thanks, Mickey! I experienced the same issue during testing. 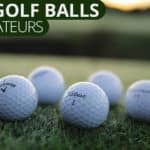 It defintiely gets better as it learns, but if you play a lot of different golf courses you may want to check out some of the Garmin watches. They’re much farther along in perfecting GPS technology. That is definitely not normal. 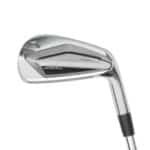 You should contact Callaway and obtain a replacement.